Manathakkali keerai is called as black nightshade in English. It is a perfect remedy to cure mouth ulcers. I personally use this as a home remedy whenever i get mouth ulcers. It worked like a charm every time. 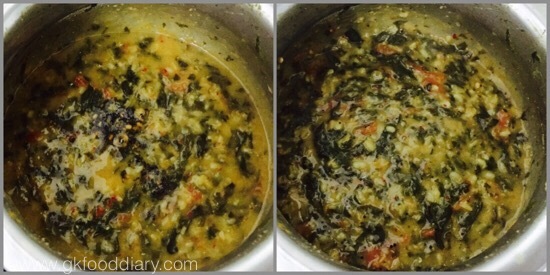 I make masiyal or thanni saru with this healthy manathakkali keerai. This manathakkali keerai masiyal is very easy to prepare and it goes well with hot steamed rice and any poriyal. 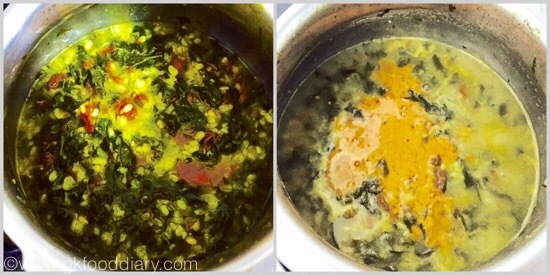 I used to mix with rice & ghee and have it ,tastes heavenly. 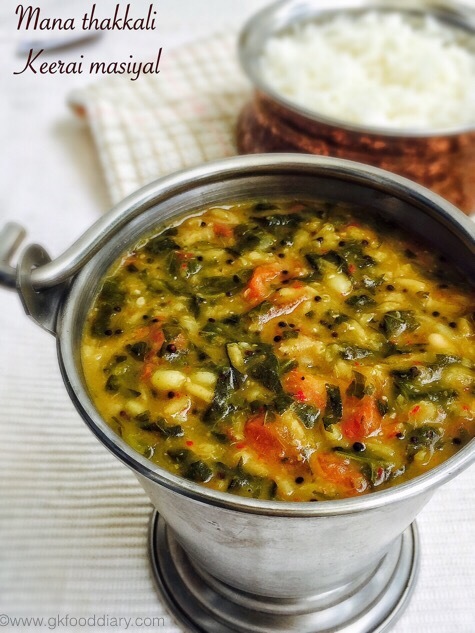 You can have this manathakkali keerai masiyal as a side dish with sambar or rasam too. Let’s get on to learn how to make manathakkali keerai masiyal. 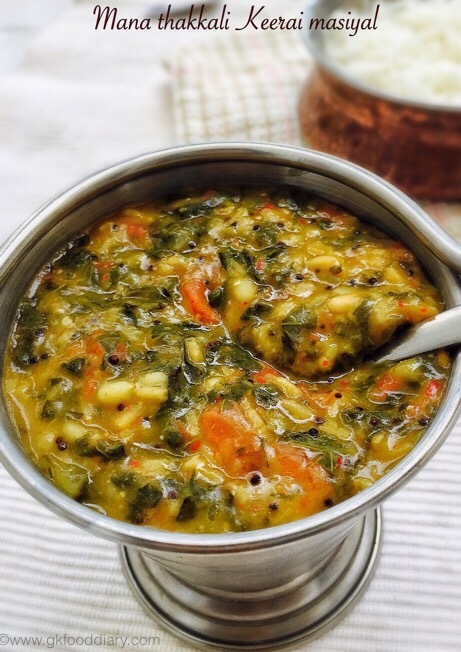 Manathakkali keerai masiyal - South Indian style masiyal with manathakkali /black nightshade and moong dal. Take the manathakkali keerai bunch and take the leaves alone from the stem. Wash it twice to completely get rid of the muds. Then chop the leaves roughly and keep aside. Grind fried gram dal, red chillies and cumin seeds with little water to a fine paste and keep it ready. Take a small pressure cooker and add washed manathakkali leaves along with moong dal, turneric powder , required salt and chopped tomatoes. Pressure cook it with ½ cup of water for three whistles. Open the cooker once pressure released and mash it well. Mix everything together and boil the manathakkali masiyal in low flame for five minutes. Add ¼ cup of water if it is too thick. Once the masiyal becomes slightly thick, add the ground red chilli paste to the boiling masiyal. Mix it well and boil the masiyal for three minutes and switch off the flame once everything comes together. Heat a tadka pan with ghee and add mustard seeds, urad dal and hing. Fry for a minute and remove from the pan. Switch off the flame and add it to the manathakkali keerai masiyal. Mix well and serve. 1. Take the manathakkali keerai bunch and take the leaves alone from the stem. Wash it twice to completely get rid of the mud. Then chop the leaves roughly and keep aside. 2. 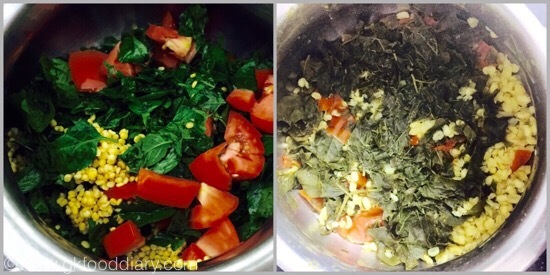 Grind fried gram dal, red chillies and cumin seeds with little water to a fine paste and keep it ready. 1. 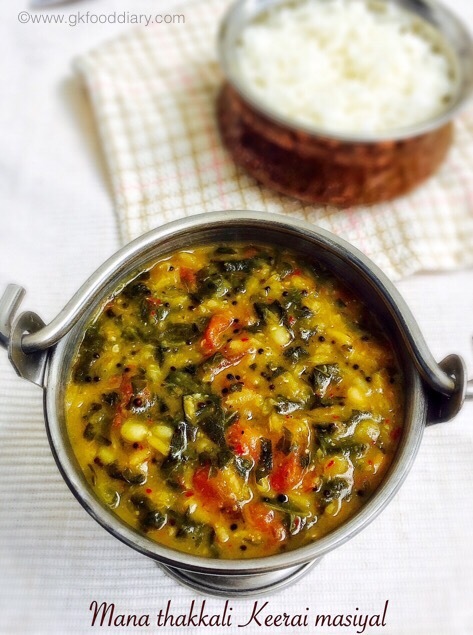 Take a small pressure cooker and add washed manathakkali leaves along with moong dal, turmeric powder , required salt and chopped tomatoes. Pressure cook it with 1/2 cup of water for three whistles. Open the cooker once pressure released and mash it well. 2. 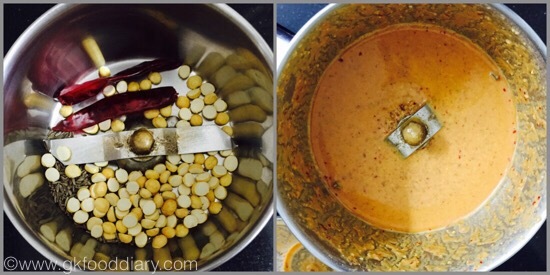 Mix everything together and boil the manathakkali masiyal in low flame for five minutes. Add 1/4 cup of water if it is too thick. Once the masiyal becomes slightly thick, add the ground red chilli paste to the boiling masiyal. 3. Mix it well and boil the masiyal for three minutes and switch off the flame once everything comes together. Heat a tadka pan with ghee and add mustard seeds, urad dal and hing. Fry for a minute and remove from the pan. Switch off the flame and add it to the manathakkali keerai masiyal. Mix well and serve. 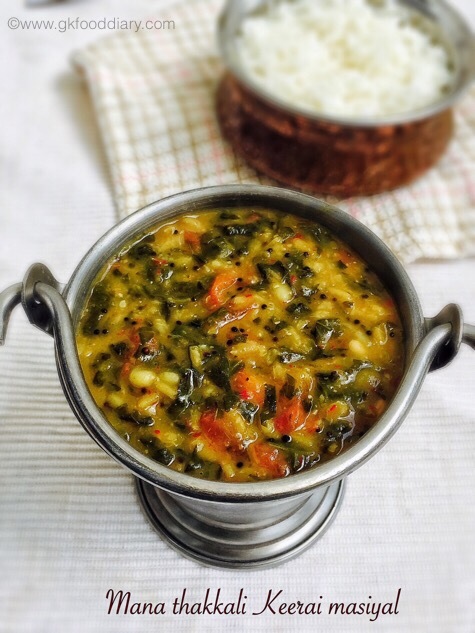 Serve the manathakkali keerai masiyal with hot steamed rice and any stir fry of your choice. Keep the flame in low to medium while boiling the masiyal in order to avoid the bottom to get sticked. This masiyal gets thicken with time so switch off the flame accordingly. 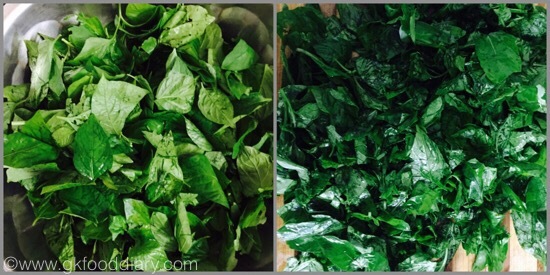 Chopping the manathakkali leaves after washing is very important. Otherwise it wont get cooked evenly.